On our way to North Carolina’s Outer Banks, where my extended family would soon convene for Thanksgiving, we’d go by place I had wanted to visit for years: Daniels Seafood and Crab House. It was the setting of a 1999 feature story about migrant agricultural workers, by Anne Hull, then at the St. Petersburg Times and now at the Washington Post. Una Vida Mejor: A Better Life tells the story of a group of Mexican women who travel more than 2,000 miles to pick crabs as guest-workers, on H2A visas. … the evening game of soccer was played with a deflated old ball… the field was a swirl of white powder, and the shirtless young men looked as if they had been rolled in flour. … hundreds of cooked crabs were heaped on silver tables, waiting for them. The clock above the sink read 6:45 a.m. Delia and Ceci stood on the concrete floor, blinking against the fluorescent lights. … a wall-unit air conditioner pumped against the summer heat. One windowless bedroom occupied by a worker named Esmerelda became known as El Horno de Esme. Esmerelda’s oven. Its careful revelation of what’s at stake for its subjects makes you care what happens next. And when its main characters change, learning something unexpected, we learn something too. As we drove east in the waning months of the Carolina growing season, past denuded tobacco fields and roadside bales of cotton the size of a school bus, I told my teenager Greta all about the article and how cool it would be to meet Mickey Daniels and some of his H2A workers. “Can we eat lunch there?” she asked. The H2A guest-worker program has expanded steadily over the past decade with more than 85,000 workers authorized in 2012 – nearly twice as many as when Anne Hull wrote her story. Despite complaints of too much red tape for growers and too few rights for the workers, the program does let Mexican laborers earn an hourly wage in North Carolina of $10.32 (it varies by state), more than what they can earn in a day back home. It did. I turned the car around, heading west now on the causeway connecting the Outer Banks to the mainland. “Like that one?” said Greta, pointing to a squat gray building on the edge of the water, clearly abandoned. “That can’t be it,” I assured her. We continued west, nearly to the mainland, with no sign of it. Greta was right. 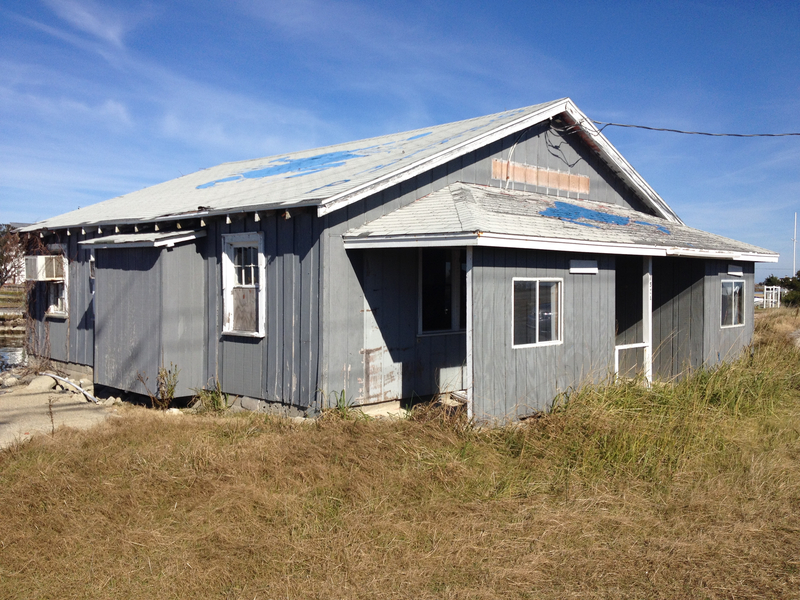 I headed back east and pulled off at what was once Daniels Seafood and Crab House and now an empty shack waiting for a bulldozer, bathed in bright sunlight. Tall weeds swayed in the cool wind blowing off the water. I peered through dirty windows onto sun-bleached floors, littered with debris. It was eerily quiet, save when a car zoomed by. You could, and I did, to peer at artifacts from the story: The giant steamer. The concrete floor. The fluorescent lights that once made Delia and Ceci blink their bleary eyes. So much for meeting Mickey Daniels, or his H2A workers. But of course I don’t need to. Thousands will be all over North Carolina, starting in just a few months, and I can meet plenty then. And there’s always Ann Hull’s story, a click away. They are human capital, ordered like product and shipped in for a season. A handful of women from a windblown village in Mexico set out for a better life – una vida mejor -on the back roads of the new world economy. © Copyright 2006 St. Petersburg Times. All rights reserved.